If you've decided to change your saltwater aquarium into a freshwater aquarium, give yourself plenty of time to find new homes for your saltwater fish, coral and plants. Saltwater fish and plants cannot survive in a freshwater aquarium. Once your plants and animals have a new home, thoroughly clean and refurbish the fish tank. 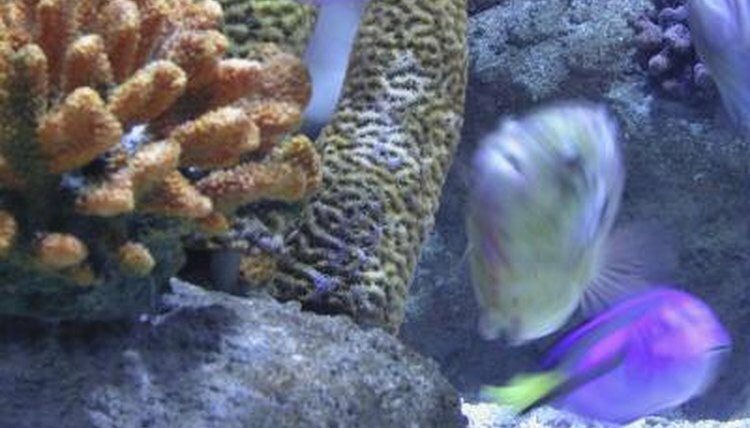 The first step after removing living creatures from the saltwater tank is to disconnect the filter, lights and other accessories. Drain the tank of all saltwater and discard the filter pads and sand. You can't reuse sand from a saltwater tank in a freshwater aquarium. Give away artificial plants and accessories that you can't sterilize wholly, those that are hard to clean. Set aside any accessories you want to keep. Fill a clean bucket with a mixture of 1 gallon of water and 1 cup of white vinegar. Use a brand-new sponge to scrub the interior of the empty tank with the water-and-vinegar mix. Vinegar is safe to use, but you may want to wear rubber gloves to keep your hands dry. Rinse the solution thoroughly when you've finished scrubbing the empty tank. Any accessories you want to use from the saltwater tank in the freshwater aquarium must be thoroughly cleaned and sterilized. Fill a clean bucket with a diluted bleach solution. You can use about a half-cup to 1 cup of bleach to 1 gallon of cold water. Do not add any other chemicals to the diluted bleach solution. Submerse the aquarium accessories such as plastic plants in the bleach solution for at least an hour. Remove the pieces from the solution and rinse clean in cold running water. Let them air-dry overnight. When you're sure the tank and accessories are clean and well-rinsed to remove all traces of vinegar and bleach, assemble the freshwater aquarium. Discard the protein skimmer and use either a new filter for freshwater aquariums or a filter with new pads. Add new gravel to the tank bottom, replace the accessories, and add water. Be sure to add water conditioner for tropical fish to make sure that the pH is right and that harmful chemicals are removed from the water. Replace and run the filter and lights before adding tropical fish to the freshwater aquarium. Saltwater Aquarium Secrets: Can I Convert a Saltwater Tank to a Freshwater Aquarium?